Did you ever hear about the kindest and most delightful clown kid that ever traveled the circus circuit? We’re talking about a real goofball, telling jokes, tripping over himself, playing the perfect pranks on the lion tamer, and making some fantastic balloon animals to make up for the tricks. Before long, the invitations began. “Come to my birthday party!” people cried and that kiddo clown was more than happy to join and spread the fun. And, hey, earning a nice slice of cake and heading home with a bucket of extra candy never hurt any clown! But, not all people are as kind as this generous clown. Some people think they’re weird or, worse, just ignore them all together. Everyone knows that a clown’s power comes from the attention that it can garner! So, when this loving kiddo went to a party and everyone not only ignored the hysterical antics but refused to share any of those delightful treats… well… let’s just say that you never want to see what happens when a clown’s act goes ignored and unpaid! It gives birth to a true monster. Sadly, that seems to be the tale of your kiddo. Happy clown turned into a candy-snatching killer, your tyke is out for candy vengeance and is going to get it through some tricks and skip the middle man! This red and black, half striped and half blood-marked polyester satin jumpsuit shows what happens when a happy clown goes rogue. The once ruffled silver foam collar is now shaped like a saw blade and the molded latex mask has wild black hair and the most vicious sort of smile you’ll ever see. Fortunately, we’re pretty sure it hungers more for treats than carnage… but you never really know with those clowns. Best be ready to giggle at their antics… just in case. 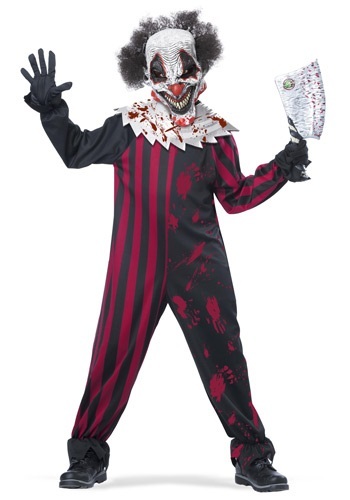 I ordered this costume for my ten-year-old son and it absolutely fitted perfect. It was of great quality and we received a lot of compliments on this. Well worth it! !